Since its foundation, it took Sluis barely a few decades to turn into one of the most important ports in the Low Lands. This was mainly due to the proximity of Bruges and its strategic location at the estuary of the Zwin. The town enjoyed its greatest prosperity at the end of the 14th century. Sluis was important and such a crucial asset had to be properly protected. In 1382, the Count of Flanders (Louis of Male) ordered to reinforce Sluis. Three years later the construction of the castle started. The town itself was surrounded by a wall and a ditch; you could only get inside via the town gates. On both sides of the Zwin fortifications were built and the entry of the port itself was protected by two heavy towers from where all navigation could be controlled. If needed, the port could be completely closed off. 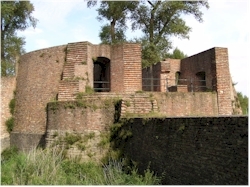 The fortifications were adapted in the course of the centuries according to the changing tactics in warfare and expanded by the different rulers that controlled Flanders in the course of time. At the end of the 16th century the walls were reinforced due to the threat of the Spanish troops. A last modification was implemented around 1702 according to the plans of military architect Menno van Coehoorn. During turbulent times in the town's history, the walls had to endure quite a bit. In 1437, the West Gate was destroyed by troops from Bruges because Sluis did not respect the stacking rights. In 1587, the town was occupied by the Duke of Parma. In 1604, after a long siege, Prince Maurits of Nassau managed to capture Sluis from the Spaniards. In 1794, there was a heavy artillery attack from the French and in 1944 the town was almost completely flattened in an air raid. 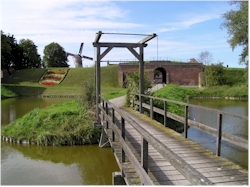 Nowadays, Sluis still has two town gates (the East Gate and the South Gate) and the remains of another one (the Stone Bear). The East Gate (Oostpoort) was erected between 1425 and 1432. Spanish troops attacked the town here in 1606 but didn't succeed in their objective. They suffered a humiliating defeat with heavy casualties. What we can see today is only a part of the gate which was originally much larger. 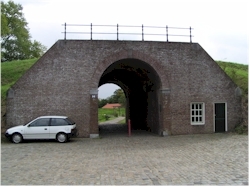 The South Gate (Zuidpoort) allows access to the town from the direction of Aardenburg. Initially there was a wooden gate on this place that was replaced with a stone construction in 1406. That gate was larger than the current one. When the walls were updated in the 17th century, the upper structure of the gate was removed. Via a wooden brigde you can cross the moat here to reach the walking trail. The Stone Bear (Steenen Beer). This ruin of the West Gate or Bruges Gate is also called the Stone Bear. As the name already implies, this gate was the access point from the direction of Bruges. This particular gate replaced an older one that was destroyed by troops from Bruges in 1437. It took no less than 12 years to complete this impressive stronghld (from 1444 till 1456 to be precise). The complex constisted of an armory and a barracks for soldiers. The access road itself was in the middle. Via a drawbrigde over the moat you could enter the town. In case of danger, the gate and the access to the town could be sealed off. Through an underground corridor the gunpowder magazine could be reached. Heavy stone walls protected the complex. The Duke of Parma nevertheless succeeded in 1587 to capture the town, ruining the gate in the process. 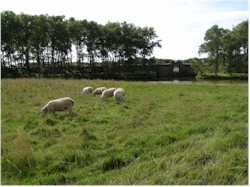 There is a walking trail on and around the walls from which you have a great view on all the gates, the moats, ditches and walls. You also have nice view the surrounding flatlands.